Looking to become a nurse? Nightingale College launches its newest hub in Brigham City with the help of local health care partners. Nightingale College learners collaborate during an experiential learning activity. 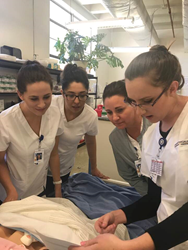 With the help of local health care facilities in and around Brigham City, Nightingale College is the newest institution to launch its accredited associate and bachelor’s degree nursing programs. Nightingale College’s unique education model combines online classroom instruction and local, on-ground learning activities under the supervision of a faculty member to deliver its nursing program courses. Learners complete classroom assignments and lectures online then commute to their designated experiential learning hub to practice the hands-on portion requirements of the courses. Health care facilities struggle to employ enough nurses due to potential nurses relocating for school and the current nursing workforce reaching retirement age. These factors make it difficult for health care facilities to meet the community’s needs. Alongside the demand for registered nurses is the rising need for accessible educational options—a necessity recognized by Nightingale College. As of October 2018, Brigham City joins Nightingale College’s three other partnership cohorts in Utah and becomes the tenth Dedicated Distance Cohort (DDC) area. “We are looking forward to the opportunity to continue partnering with facilities in Utah and expanding our nursing programs reach to provide a solution that will not only assist our partners in supporting competent RNs in their facilities but help improve the community’s health care,” said Tanner. Nightingale College’s is currently enrolling in both the associate and bachelor’s degree nursing programs. Nightingale College® pioneers a unique and innovative delivery of nursing education focused on helping communities grow and maintain a pool of confident, competent, and compassionate nurses. Through the partnerships with numerous health care facilities across multiple states, accessibility of its accredited nursing degree programs (associate and bachelor’s degree nursing programs), and with collaboration of a dedicated staff of innovative thinkers, the College enables communities and health care facilities to better manage safe and effective patient care with local nurses dedicated to serving their community. This unique education model and collaboration with partners increase the pool of qualified nurses in the area, provides an additional pathway to a nursing degree where there may have not been one, and promotes quality patient care and safety. To find out more about Nightingale College, its programs, and how the College is reshaping nursing education, visit https://nightingale.edu/.